From our health to the economy, every aspect of our life is affected by the quality of our environment. This newsletter highlights legislation that the Assembly’s Environmental Conservation Committee has focused on this year. We have worked diligently to protect our most valuable natural resources and ensure a healthy environment. I am proud of what we have accomplished to protect our most valuable natural resources, but much more still needs to be done. I look forward to working with the Senate and Governor Spitzer to ensure a healthy environment for both today’s New Yorkers and future generations. Environmental Protection Fund. This new law increases the Environmental Protection Fund to $300 million. The EPF was established in 1993 for capital projects that support clean air and water, protect the state’s environment and preserve open spaces and farmland (A.8339–Sweeney; Chapter 258 Laws of 2007). Vehicle Global Warming Labels. This law requires that vehicle global warming index labels be affixed to motor vehicles manufactured for the model year 2009 and for subsequent model years. Under the bill, not only would these labels disclose a vehicle’s fuel efficiency, but also its score on the global warming index. The measure would inform consumers of a vehicle’s impact on air quality by requiring the disclosure of an automobile’s total carbon emission level (A.8839–Sweeney; Chapter 466 of the Laws of 2007). Sea Level Rise Task Force. Creates the New York State Sea Level Rise Task Force to evaluate ways of protecting New York’s remaining coastal ecosystems and natural habitats, and increasing coastal community resilience in the face of sea level rise (A.9002–Sweeney; Chapter 613 of the Laws of 2007). Revitalizing DEC. The State’s budget authorizes the hiring of 109 new staff positions at the Department of Environmental Conservation (A.4305; Chapter 55; Budget of 2007). Solar Tax Credits for Co-ops and Condominiums. Equal to 25 percent of the cost of installing solar electric-generating systems, the law will make solar a viable option for multi-unit dwellings such as co-ops and condominiums (A.7451–Farrell; Chapter 128 Laws of 2007). The Committee on Environmental Conservation held a hearing to review the DEC’s implementation of the State Budget and its impact on environmental programs. The Department of Environmental Conservation is responsible for conserving and improving New York’s natural resources, managing the state’s fish, wildlife and marine resources, and controlling water, land and air pollution to enhance the health, safety and general welfare of the state’s residents. The State Budget provides almost $1.2 billion for the environment. Left to Right: Assemblyman Brian Kavanagh, Assemblyman Adam Bradley and Assemblyman Bob Sweeney. Phase-out of Creosote. This new law provides for a phase-out of the use, combustion and disposal of creosote as a wood preservative (A.1095A–Brodsky; Chapter 172 Laws of 2007). Zoar Valley. Dedicates the Zoar Valley Unique Area to the State Nature and Historical Preserve to protect its unique gorge and ledges, tributary and riverside terraces and associated matrix forest (A.7542–Parment; Chapter 130 Laws of 2007). Invasive Species Council. Establishes the Invasive Species Council and an advisory board. The Council is responsible for the development of a comprehensive plan for invasive species management and control (A.9027A–Sweeney; Chapter 674 Laws of 2007). Water Pollution Control Linked Deposit Program. This new law will make it easier for residents, small businesses and farmers to obtain loans for water pollution control programs by establishing a linked deposit program through the Environmental Facilities Corporation (A.8460–Magee; Chapter 262 Laws of 2007). Global Warming. The budget authorizes the creation of a new Climate Change Office which will implement state policy to mitigate the negative impacts of global warming on the state’s natural environment and economy; will help to implement the Regional Greenhouse Gas Initiative (A.4305D; Chapter 55; Budget of 2007). Home Heating System Tax Credits. This bill would extend tax credits for the replacement of a home heating system with an energy star rated energy unit for two years. It also would continue the tax credit for the use of a bio-heat system for home heating towards the personal income and corporate franchise tax for four years (A.7909–Sweeney; Veto 115). Climate Change Task Force. This bill sought to create the New York State Climate Change Task Force. Under the bill, the task force would hold statewide public hearings to develop a plan on how the state should respond to climate change and its impact on the environment (A.7367A–Sweeney; Veto 114). Reducing Lead Content in Jewelry. This bill sought to provide for more stringent control over the lead content of jewelry, particularly children’s jewelry, sold in the state (A.8077–Koon; Veto 140). Green Building. The bill would create the Green Building Construction Act, requiring state agencies and authorities to comply with the United States Green Building Council Leadership in Energy and Environmental Design (LEED) ratings and guidelines (A.2005B–Lupardo; Passed Assembly). New York State Lighting Efficiency and Toxics Reduction Act. This bill would enact the “New York State Lighting Efficiency and Toxics Reduction Act,” requiring DEC to establish a plan to promote energy efficient lighting and phasing out the use of inefficient lighting methods and devices over the next 10 years. It also would require DEC to establish a program to eliminate the use of toxic materials in lighting products and promote manufacturer responsibility for the safe disposal and recycling of hazardous lighting products (A.8641-B–Sweeney; Passed Assembly). Climate Change Solutions Program Act. This legislation addresses concerns about global warming and the need for the state to reduce its hydrocarbon emission levels with measures that would create a Climate Change Solutions Program. The bill would require that state funds raised from the Regional Greenhouse Gas Initiative (RGGI) be used for supporting energy efficiency programs. The funds would also be used to promote energy efficiency, enhance the state’s air quality and develop clean, renewable sources of energy (A.7365–Sweeney; Passed Assembly & A.7366–Gianaris; Passed Assembly). Well Water Testing. This bill would require the testing of private wells upon the sale or transfer of real property as well as periodic well testing on properties that are leased. The legislation would help inform property owners and tenants about the quality of the water that is available in their homes (A.7231–Jaffee; Passed Assembly). Wetland Protections. This bill would strengthen and enhance the state’s wetland protection laws by expanding DEC’s regulatory jurisdiction. The current law restricts DEC’s oversight of wetlands to areas that exceed 2.4 acres. Under the bill, DEC would be authorized to oversee wetland areas of one acre (or smaller, if adjacent to a body of water or of special significance), in order to ensure the continued protection of wetlands which were previously regulated by the federal government (A.7133–Sweeney; Passed Assembly). Community Preservation Act. This bill would authorize cities and towns in New York State to adopt, after a referendum, a transfer tax on real property transactions of up to one percent for the purpose of establishing a community preservation fund to be used for land conservation and historic preservation (A.7333–Sweeney; Passed Assembly). Open Burning. This bill would prohibit the open burning of household waste which has been shown to release a myriad of toxic pollutants into the air (A.5457–Koon; Passed Assembly). Local Recycling. This bill clarifies the obligations of waste haulers regarding the handling of recyclable materials and specifies materials that are to be separated for recycling. It also would specify materials which must be included under local recycling laws. (A.3318–Colton; Passed Assembly). Plastic Bag Reuse and Recycling Act. This bill would enact the “Plastic Bag Reuse and Recycling Act” (A.8810B–Sweeney; Passed Assembly). State Environmental Quality Review Act (SEQRA). The bill would allow individuals to challenge SEQRA determinations without regard to whether the project affects an individual or the public at large (A.1435–Bradley; Passed Assembly). Smart Growth. The bill would establish the State Smart Growth Public Infrastructure Policy Act to ensure that the use of state funds for infrastructure projects is consistent with “smart growth principles.” The legislation aims to ensure that the development of land is done in a way that uses existing infrastructure and is compatible with the development plans of local governments and also makes economic and environmental sense (A.7335–Hoyt; Passed Assembly). Environmental Justice. This bill would require the DEC to consider environmental justice issues when conducting the state environmental quality review process. Under the bill, DEC also would be required to publish a list of those areas in the state that are most adversely affected by existing environmental hazards (A.2002–Diaz, R.; Passed Assembly). State Pesticide Phase-out. This bill would phase out the use of pesticides on state property and in state property pest management procedures. It would require the DEC to develop a pest management plan that identifies methods for monitoring pest populations and compile a list of the least toxic pesticides that are to be used before January 1, 2008. To help the state’s agencies comply with the total pesticide phase out, DEC would be mandated to identify non-chemical pest control strategies for use after that date (A.1142–Brodsky; Passed Assembly). Urban Pesticide Use. This bill would establish an Urban Pesticide Board to investigate the sale and use of industrial strength pesticides in urban areas. The board would also make recommendations to the Governor and Legislature regarding the enforcement of existing restrictions and educate the public about the hazards of using pesticides in the home (A.5299–Wright; Passed Assembly). Green Buildings. Requires new or substantially reconstructed State agency buildings to comply with the United States Green Building Council Leadership in Energy and Environmental Design (LEED) (A.2005B–Lupardo; Passed Assembly). The Assembly Environmental Conservation Committee held a hearing in Clayton, NY to examine the problems caused by invasive species. Invasive species pose significant threats to ecosystems throughout New York State and cost the state, municipalities and businesses millions of dollars each year. Invasive species are non-native species whose economic or environmental harm outweigh any benefits. Left to Right: Assemblymen Bob Sweeney and Darrel Aubertine. Invasive species. The Environmental Conservation Committee and the Legislative Commission on State and Local Relations recently held a hearing in Clayton, NY to assess the environmental and economic impacts of invasive species and pathogens in New York. Invasive species pose significant threats to ecosystems throughout New York State, and cost the State, municipalities and businesses millions of dollars each year. Invasive species are non-native species whose economic or environmental harm outweigh any benefits. Since the 1800’s over 180 aquatic invasive species have been discovered in the Great Lakes alone, out-competing native species and diminishing biological diversity. Invasive species have a detrimental effect upon the State’s fresh and tidal wetlands, water bodies and waterways, forests, meadows and grasslands, and, in some cases, change entire ecosystems. Particularly affected by invasive species are water supplies, agriculture and recreation. Brownfields. The Assembly Environmental Conservation Committee held a series of joint hearings with the Senate Environmental Conservation Committee regarding the implementation of the State’s Brownfield programs. The Brownfield Cleanup Program (BCP) was created in 2003 to encourage the cleanup, remediation and redevelopment of underutilized contaminated sites throughout New York State. The BCP provides protective cleanup standards, liability relief and financial incentives, including tax credits for cleanup and redevelopment costs of brownfield sites. To date, the Department of Environmental Conservation (DEC) has received 349 applications for the BCP with 239 sites qualifying for the program and 28 sites having received Certificates of Completion. The committee is reviewing testimony and new legislation to strengthen the program is anticipated in the near future. Department of Environmental Conservation Budget. The Assembly Environmental Conservation Committee also held a hearing to review the Department of Environmental Conservations (DEC) implementation of the State Budget and the impacts on State environmental programs. DEC is responsible for conserving and improving New York’s natural resources, managing the State’s fish, wildlife and marine resources, and controlling water, land and air pollution to enhance the health, safety and general welfare of the State’s residents. The State Budget provides almost $1.2 billion for the environment. The budget provides a record $250 million in funding for the Environmental Protection Fund (EPF). 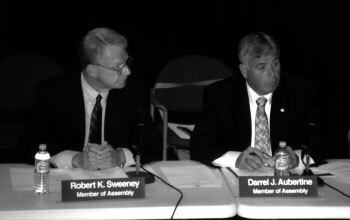 Assemblyman Sweeney makes a point during joint hearings in Albany by the Assembly and Senate Environmental Conservation Committees. The Brownfield Cleanup Program encourages the remediation and redevelopment of underutilized contaminated sites throughout New York State. On Long Island, DEC Commissioner Grannis is pictured testifying before joint hearings by the Assembly and Senate Environmental Conservation Committees regarding New York’s Brownfield program. 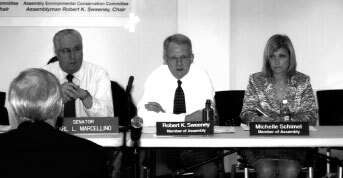 Left to Right: Senator Carl Marcellino, Chair, Senate Environmental Conservation Committee; Assemblyman Bob Sweeney, Chair, Assembly Environmental Conservation Committee; Assemblywoman Michelle Schimel, Assembly Environmental Conservation Committee member. 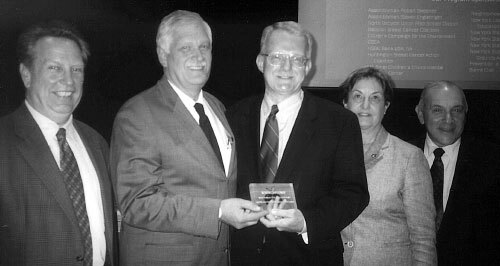 Assemblyman Sweeney is presented with the 2007 Healthy Schools Hero award by last year’s recipient, Assemblyman Steve Englebright. Left to Right: Jeff Jones, NYS Chair, Healthy Schools; Assemblyman Steve Englebright, 2006 Healthy Schools Hero; Assemblyman Sweeney; Healthy Schools Network Executive Director Claire Barnett and North Babylon School Superintendent Dr. Joseph Laria. Assemblyman Bob Sweeney has been named “Legislator of the Year” by EPL/Environmental Advocates, a non-profit organization that has worked on behalf of environmental issues in New York State for nearly 40 years. EPL/Environmental Advocates was one of the first organizations in the nation formed to advocate for the future of a state’s environment and the health of its citizens. In naming Sweeney “Legislator of the Year,” EPL/EA noted that he was appointed Chair of the Assembly Environmental Conservation Committee this past March, three months into the 2007 legislative session.